Back in the day, writers had two choices as writing tools: a pen and paper, or a clunky old Olivetti typewriter (or equivalent – mine was an Olympia portable). Obviously, and thankfully (for most of us), the desktop computer changed all that. 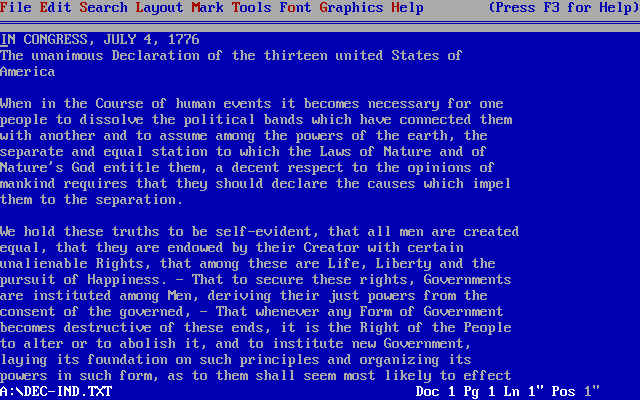 I think the first word processing software I used was WordPerfect 5.1 for DOS. It was white type on a blue screen and not much else, but at least you could correct a misspelling without reaching for the Tipp-ex. Eventually Microsoft Word took on the mantle of 'go to' writing tool, and it has reigned supreme for over 20 years. MS Word is ubiquitous to say the least, particularly in workplaces. One of the biggest drawbacks of MS Word's dominance has been its evergrowing list of features. Today's MS Word is so feature rich that it has become almost impossible to find some tools. The various attempts to improve its interface, most notably with the addition of the 'ribbon)', have only made things worse. The thing is, if you have a writing task ahead of you – you're writing a blog post, an article or a book – you need very few of MS Word's features. It's like having one of those fifty-button remote controls when all you want to do is turn the television on. MS Word has other drawbacks too. It is bad for blogs because it creates horribly messy code when you copy-and-paste into a lot of blogging software. And it is bad for book writing because it has a tendency to become unstable with long files, and its organisational tools are mediocre at best. There are hundreds of alternatives to Microsoft Word if all you want to do is write. They fall broadly into three groups. Basic text editors are the digital eqivalent of the typewriter. Like a typewriter, they allow you to do one thing – write. No choices of fonts, no variation in font size. Not even bold or underline. Notepad, built into Microsoft Windows, and TextEdit, built into Apple's OS X, both work in this way. Want truly distraction free writing? Start here. A step up is the 'RTF' (Rich Text Format) editor which allows some basic formatting of text but doesn't try to be a layout tool as well (which is where Word tends to fall down by trying to do too much not very well). RTF tools are good for writing longer pieces because you can create headings and emphasise text. TextEdit doubles as an RTF editor on the Mac; on Windows, Wordpad is a separate built-in application that does the job. There are plenty of distraction-free writing alternatives on both platforms if you choose to hunt around. My definition of 'word processor' for this purpose is a program that allows you to do both writing and layout work, and also allows you to add footnotes or end notes, make comments and track changes to your work. Tracking changes is particularly useful for collaboration – as a ghostwriter this is a feature I use all the time with my clients. In this 'space', MS Word dominates but it isn't the only player. Believe it or not, Corel still produces WordPerfect for Windows, and it does a lot more than white text on a blue screen these days. On the Apple, iWork Pages has a very clean interface, is nice to work with and it syncs with its iOS counterpart. OpenOffice is a free office suite that includes Writer, a very capable word processor. OpenOffice is available for Windows, Mac OS-X and Linux. Then there are the web-based options such as Google Docs, which is less sophisticated as a word processor but excellent for collaboration. At the advanced end of the scale are programs like Scrivener – complete toolkits for long writing projects. I use Scrivener more than any other tool. In fact I would find it hard to manage a book-writing project without it. Scrivener has an enormous feature set, but those features are aimed at writers, not designers, so they make researching, outlining, drafting and re-writing a whole lot easier. And Scrivener is highly robust – your work is saved every few seconds. Scrivener is the only application in this category that I have any experience with, but there are alternatives if you prefer to shop around. If writing is your focus, invest the time to find and learn to use tools that will help you get the job done with minimal distraction and a feature set that supports, rather than hinders, the task. Don't just use Microsoft Word because it's all you know. This post was updated on April 10, 2014 to add a link to OpenOffice.